The wait is over, WRC is back in action again. Rally Deutschland and the glorious tarmac are ahead of us. 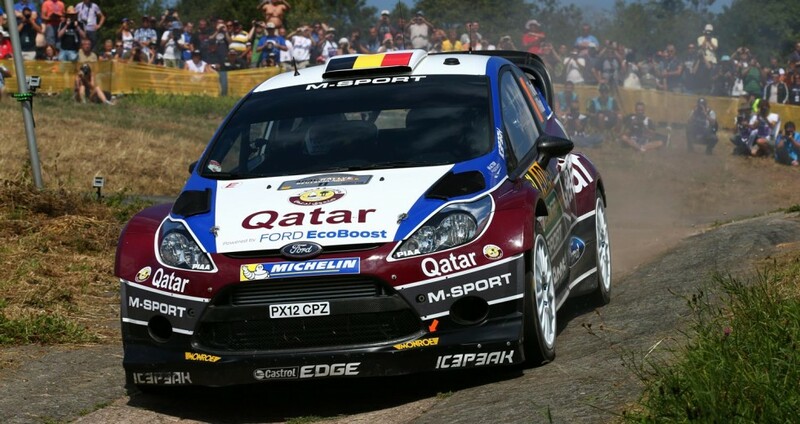 Two stages down and it’s already pretty obvious that Sebastien Ogier is the man to beat. After all, he’s after the title and I suppose that equals massive motivation. Easier said than done, though. First stage was pretty deceiving and drivers had to adapt their expectations and driving style to the tricky conditions – tyres were not warming up as quickly as some drivers wanted and some of the corners were quite slippery. Evgeny Novikov became Evgeny Novikoff – pushed too hard and slid off the road. He did manage to escape damaging the car, but there was no way to return the Fiesta to the road and rally was over for young and fast Russian, until tomorrow that is. Ogier might be the fastest of them all after first two stages, but his pace was within reach of several competitors. Jari-Matti Latvala struggled a bit with the car, as did the rest of the drivers, but managed to lose only 5.7 seconds to Ogier. Thierry Neuville was damn quick again, even though he also had some issues to solve with regards to driving style. First six crews are within 30 seconds, which hopefully equalls exciting remainder of the event. Yes, I am pretty much looking at you Mr. Sordo, time to deliver is now – keep it cool, on the road and fast. All that aside, Robert Kubica! First time here and he is already pushing the WRC crews in his WRC2 car, while also leading the category. Very amusing comment he had at the end of the second stage revealed he is looking for more power so he can rely more on driving like in a F1 car, using the proper racing lines on wider parts of the stage. One of the biggest hopes I have for 2014 is for Kubica to jump into a WRC car and try to dance with the big boys.